The international science community has identified a set of Essential Climate Variables (ECVs) that should be monitored for measuring the climate system, how it is changing, and its likely impact on future climate. Environmental satellites play an important role in this effort. They are uniquely positioned to provide broad, spatially consistent, and continuous global sampling of many of the ECVs. 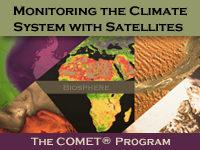 This module explores the benefits of monitoring the climate system with satellites. We begin by reviewing how satellites observe key atmospheric elements and features that are found in a variety of climate cycles and are important for studying long-term climate trends. From there, we explore events at the different scales (from seasonal to long-term) and the contributions that satellites make to improving our understanding, monitoring, and prediction of them. Finally, we discuss the challenges involved in monitoring climate with satellites. Among these is the need for continuous, stable, high-resolution, and validated measurements that are coordinated with the world’s satellite operators. Good program. Presents a lot of useful information. The modules were entertaining and easy to follow. I liked that the modules were narrated and offered a text section as well. With that said i feel the questions on the quiz were designed to trick people and often confusing. I feel the answer selections are not fair, they are design to give full credit if you know everything, when in reality it is almost impossible to know everything. There were several questions in the module that were in no way touched on in the corresponding sections. A notable example would be the mention of hyperspectral sounders, which is only mentioned by name in a single sentence with no relevant information. I would not recommend use of this module. It could have been better designed. gostei muito pos tem muitas imformacoes importante. O quiz foi bastante últil, ajudou muito.